First cabin was a fishing cabin built in 1937 by Art Quam, a second cabin was built in 1945 by Walt Quam. Today both are owned by David Quam. (1939 photo) Nie property is to the right in the photo. Left to right, Walt Quam of Grand Forks and Art Quam of Bemidji. Art built the above cabin in 1937 for a fishing camp. In 1945 Walt and Al Quam built another cabin next to Art's. There were two more brothers, Henery and Alfred. Henry was the father for David Quam, present owner along with his sister, Kathy TeHennepe. 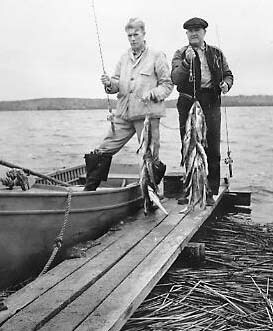 The fishing in the 1950 was very good in as much you could catch your limit most weeks. I think the possession was ten, so we would keep the fish in a "live trap" on a floating raft and when company came, scoop up a few for dinner.